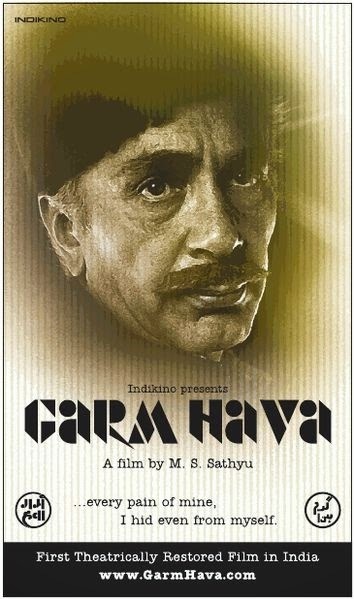 This weekend, I saw at the cinema a restored version of MS Sathyu's classic Garm Hava. The film looks at the plight of middle-class Muslims in the wake of partition from the perspective of a single family running a small scale factory in Agra. The patriarch (veteran Balraj Sahni, in arguably his most memorable role) believes in India as his home country and dismisses petitions by his friends and family to shift to Pakistan, but finds himself increasingly isolated and marginalized by social and financial institutions. Without going all melodramatic, the film underlines the frustrations of a class of Indians that finds secularism a concept that exists more on paper than in reality. In a very effective move, the film never shows the faces of non-Muslim characters that refuse to extend rightful aid (bank managers refuse loans citing the example of Muslims that run off to Pakistan after taking loans, landlords don't rent to Muslims making non-vegetarianism an issue), usually expressing helplessness due to the current social climate - these could be anybody, and giving them a face would only demonize the individual, instead of criticizing the social environment that asked for such callous behavior of its citizens. Sathyu's film is not just dry social message, it carries a personal edge too, with well-etched characterizations and emotional depth for the different family members. A sharp sense of bleak humor and a screenplay that deftly cuts between scenes to show irony makes the film interesting to sit through its entire 146min runtime. More evident now than during its screenings on television, the film also has a fine visual touch, with shots at various well-known Agra monuments that eschew the conventional postcard angles to give a more intimate feel to the scenes performed there. The restoration for large parts looks pleasingly strong. Sequences shot at the Fatehpur Sikri and Taj Mahal especially are breathtaking and have a palpable veneer compared to previous screenings on TV. The first half still has some stretches where the film has a sickly green pallor of print damage. Perhaps these were issues that were beyond repair or could not be resolved without prohibhitively expensive restoration. Sound is generally clear although some sections appear a little tinny, I suspect these are mostly limitations of the source recording and existing technology for a low-budget film. After being held up by the censors for 8 months, Garm Hava was released in '74 to high critical and public acclaim. Now this generation has a chance to see one of the classics of Hindi cinema that still holds good. Take that chance or you will be the poorer.